In October 2016 Moon Chae Won signed a new contract with her new agency Namoo Actors, home of her best friend Moon Geun Young and other actors like Ji Sung. Following the switch to Namoo Actors she was cast as one of the leads of the Korean remake of the US tv series "Criminal Minds" which premiered on July 26th, 2017. In the same year she was cast alongside of Ji Sung, Cho Seung Woo and Kim Sung Kyun in the movie "Propitious Side for Grave" which is set to premier in movie theatres in 2018. 2008 울학교 이티 / Our School's E.T. 2015 19th Bucheon International Fantastic Film Festival : Producers' Choice Award for "Today's Love"
2011 19th Republic of Korea CE&A Awards : Best Actress for "War of the Arrows"
2011 32nd Blue Dragon Awards : Best Actress for "War of the Arrows"
2011 48th Daejong Film Award : Best Actress for "War of the Arrows"
2011 27th Korea Best Dress Swain Award : Best Dresser - Female Artist for "The Princess' Man"
Actress Moon Chae Won of “The Painter of the Wind” and the leading actor of KBS “Boys Before Flowers”, Lee Min Ho, will be the endorsers for Levis. According to the news, Moon Chae Won has signed an endorser agreement with Levis, and will be filming a CF with Lee Min Ho, who is already the male endorser for Levi’s Jeans. A staff from the commercial company also revealed that Moon Chae Won and Lee Min Ho will be playing as a couple in a pure and lively commercial film. Moon Chae Won has left a deep impression among viewers with her role in SBS “The Painter of the Wind” as a famous courtesan Jeong Hyang, which eventually won her a “Best Couple” award with Moon Geun Young in 2008 SBS Drama Awards. And Lee Min Ho is one of the most popular actor currently with the viewership of “Boys Before Flowers” shooting through the roof. They had both acted in SBS “Mackerel Run” back in 2007. Here is an old interview. Can you see the movie file? I absolutely loved her yellow strapless mini dress. Thank you lisante!! You're ressourceful as usual Yes, I can see it but don't understand a word...lol What did she say? She is talking about being a cosmetic model, about her first audition and her character of Mackerel Run. MCW covers her face at her own fan meeting after they yelled out YB's lines (eg the stuff about beautiful flowers) at her. It took place around Nov/Dec 2008. I think the hoodie she wore was a birthday present from her fans. I don't know who the other woman is. 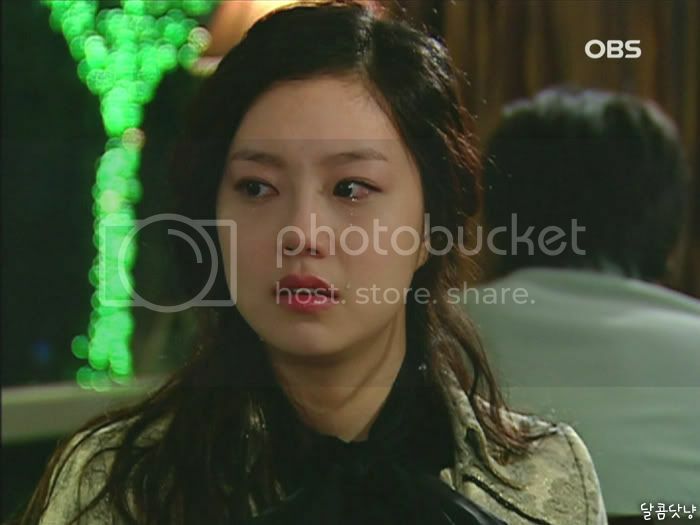 Screen caps from 2007 OSB mini series 연애의 재구성 (The Reconstruction of Love). She doesn't appear a lot. MCW asked about everyone’s health. She is reading Paradise Kiss, a manga present from her fans. Wondered what it’d be like to remake this manga into a TV drama. She thanks everyone for their support, incl those in US. It was windy and drizzling during the Levis shoot at Paju. The jeans were lovely but it was really cold in short sleeves. Will soon begin filming Life is Beautiful (working title) with POTW co-star BSB, though they never had a single scene together in POTW. She wished good health to everyone, and prayed tomorrow will be happier than today. *Coff* Somehow I can't imagine Lao Tzu saying something quite like that....! Hi there! I was wondering if there'd be anybody interested in help subbing Mackerel Run? We are currently recruiting translators for that drama. Sounds like she is playing an evil step-sister. Why most Korean drama 2nd female leads are always evil??? Though it could be MCW's first evil role, yes? BTW, the storyline sounds kind of cheesy...hope the script is good. I have my doubts about the storyline too. But I'll give it a chance for the sake of MCW and BSB. i love that she models for Levis alongside Minho. they look good together too. and yey for her new drama. at this point, she has to explore as many different roles as possible. im actually glad she chose to portray an evil step sister this time. looking forward to see her act! really love this gorgeous gal! Oh, I've never heard of this serie. Do you know where we can watch it? MCW was nominated for Best Newcomer Actress for POTW. But she is up against tough competitors like Yoon-ah (You're My Destiny) and Lee Yeon-hee (East of Eden).